Cause the minimum impact over the whales. Only go whale watching with boats or companies that have a whale watching permit. The minimum distance that should be kept from whales is 80 mt. (264 ft.) for boats without a whale watching permit. Boats with whale watching permit may approach up to 30 mt. (100 ft.). When whale watching, it is very important to try to keep a constant cruising speed with a maximum of 8 km/hr (5 mph, 4 knots), in all cases cruising speed should be slower than the slowest whale in the group. Avoid drastic changes in speed and direction within 300 mt. 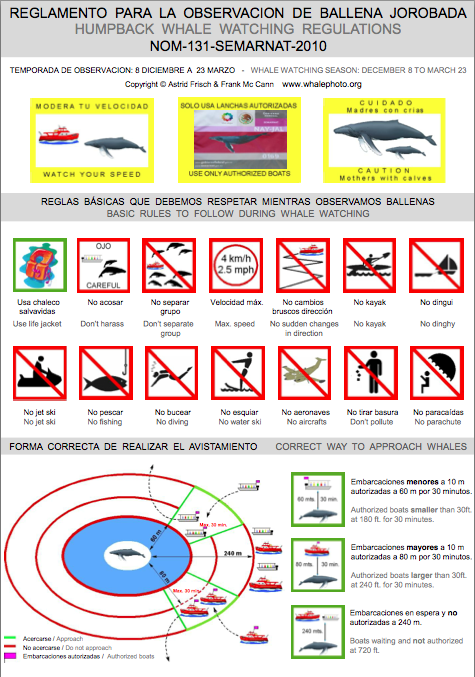 (990 ft.) to the closest whale, because this scares them and can cause a colision. If whales avoid you, change direction, breathing rhythm or modify their activity don’t approach them or move away slowly. The correct way to approach a whale is from its side and slightly from the back, never from the front, or encircling them because this could be threatening to them. Mothers with calves are very sensitive, so it is very important to be extremely careful when approaching them. It´s forbidden to cause the dispersion of a group or to interrupt its activities. 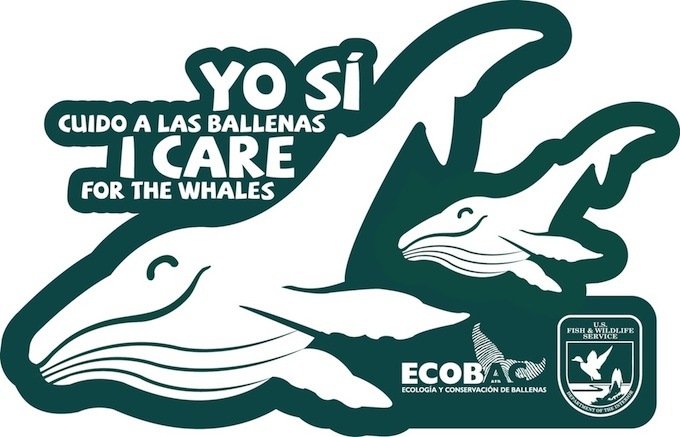 Don´t throw anything into the water, especially plastic, cigarrettes or synthetic material that can cause problems to the animals if they accidentally swallow them. Neither commercial or sport fishing should be conducted in an area where a group of whales have been identified. Activities such as swimming, snorkeling, sea kayaking, jet skiing, parachuting,or scuba diving shouldn’t be done in the area where whales are found. It could be dangerous and can also affect and change the natural behavior of the whales. For your own safety always wear a lifevest while in a motorboat.